Establishing compliant and ethical behaviour among the masses, and regulating against non-compliance is a big step in the fight against fraud and abuse. All organizations have their own unique plan in operating their businesses and achieving success, but there’s a similar foundation that sets the base of any effective program, in any industry. It’s important to promote compliant and ethical behavior, and exercise due diligence to prevent and detect criminal conduct, otherwise you’ll find your organizations subject to fines, periods of probation for federal offenses, securities, bribery, fraud, money laundering, criminal business activities, extortion, embezzlement, conspiracy, and other sinful activities that just might have your tail between your legs if caught!… and not to mention media scrutiny, front page news, verbal backlash, twitter fodder… ! 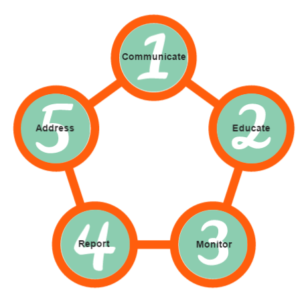 So, what are some of the elements of an effective compliance program? We’ve listed 5 below. You can see the rest in this eBook. Key to a company’s ability to create a culture of integrity is to ensure employees are communicated to and understand what standards and procedures they should be adhering to. Employees, and all stakeholders for that matter, need to be living and breathing the organization’s Code of Conduct. Expected behaviour, as outlined in the Code, needs to be understood by everyone. So go ahead, educate everyone – have lunch and learns, team meetings, performance reviews… communicate, then communicate again. Education and training organization-wide is vital to the success of your program. Many organizations have policies in place but have not communicated them fully to achieve optimum success. Then you find people doing things they’re not supposed to (fraud-because it “wasn’t clear”) and the organization suddenly finds itself in hot water. All stakeholders need to understand the Code and need to prove they understand it via verification. So start collecting those signatures as proof. Any internal system needs to be checked out to see if it’s working. Auditing and monitoring the ethics and compliance program should be top of mind of the compliance officer. A focus on ensuring that relationships with third-party vendors, financial and accounting entities, remain compliant in order to prevent fraud, bribes, abuse, and other wrongdoings. Organizations should have a formal whistleblower system in place as part of their ethics and compliance program. It’s important to ensure that every employee and stakeholder has a place to safely and anonymously report or voice any allegations of wrongdoing without fear of retaliation. Implementing a third-party system is the best solution to allow reporting of wrongdoing anonymously and ensures employees feel safe to voice their concerns. Don’t ignore any allegation that comes forward. By responding to complaints, you’re showing an interest in what whistleblowers are feeling or experiencing that made them come forward in the first place. Not all allegations may need outside help – IE stealing, harassment, etc. Some may actually be HR queries. But by communicating with the whistleblower, keeping them informed of the process, goes a long way! Should your organization find itself suddenly the focus of felonious conduct, having an effective ethics and compliance program in place can greatly reduce any sentencing or fines the organization can incur. By protecting your organization with a comprehensive ethics and compliance program, you lessen your chances of facing major fines and violations. In some cases, regulators will lessen violations, or cast aside incidents altogether, due to the well functioning compliance program existing in that particular organization.